Combining finance and litigation has long interested me. If financial types got involved, I thought they would help clients value cases and drive practice efficiency, including more use of technology. I suggested this in my 2003 American Lawyer article, A Marketplace Trial. My 2007 blog post, Collateralized Legal Obligations, discussed “measuring and predicting risk and bundling pending suits” to “create a portfolio investment”. I also noted that such investments would offer risk not correlated to other instruments, a big factor cited in Litigation Funding Moves Into Mainstream, Wall Street Journal, 5 August 2016. But I missed litigation financing. Shortly after learning about it, I read the 2010 Rand Corporation’s Alternative Litigation Financing in the United States study. None of the many articles I’ve read since explain exactly how it works from an investor perspective. Hence my discussion with Dave. Bentham’s parent company, IMF Bentham, based in Australia, pioneered commercial litigation finance 15 years ago. Australia was a good place to start because it had an adverse costs / “losers pay” legal system, and contingency fees were not then permitted. Bentham’s founders saw that those restrictions left many meritorious claims on the table. When the company started financing cases, some challenges were made to its legality. The Australian High Court ultimately ruled that funding was not only legal and permitted, but that it was beneficial to the judicial system because it helped provide access to justice and leveled the playing field for litigants. Today, the company is ASX traded and funds a high percent of all funded cases in Australia. Bentham raises capital from its equity holders and from public bond offerings, as well as from returns on its successful investments. Bentham began operating in the US when it opened in NYC in 2011. Today, it also has US offices in SF and LA and plans more in other major US legal markets. Bentham recently opened an office in Toronto, and it funds cases throughout Asia through its Australian offices. The company has funded over 180 cases to completion and returned funds in about 90% of them, amounting to over $1.7B. About 63% of those returns were paid to claimants, with the rest split between Bentham and counsel. Bentham has been financially successful, with an approximate 2.8x return on its invested capital over its 15-year life. The average time to maturity of a case is 2.5 years. The internal rate of return (IRR) is almost 80%. All of Bentham’s US investment managers have at least 15 years of litigation and trial experience, as does Dave, who spent most of his career as a Gibson Dunn litigator. Bentham funds a variety of commercial litigation, from breach of contract to patent. It usually commits between $1M and $10M for individual cases. This funding can be used to cover attorney’s fees, out of pocket costs of litigation, as well as operating capital or living expenses of claimants. Bentham also funds law firms directly if they bundle a “portfolio” of three or more contingent cases. All of Bentham’s funding is “non-recourse” except to the litigation proceeds: Bentham only receives a return if the case is successful, i.e., it results in a collected settlement or judgment. When clients lose, Bentham earns nothing and loses its capital. Dave reports that Bentham strives for fairness and believes claimants in funded cases should receive the majority of litigation proceeds. Bentham structures investments so that that is the most likely outcome. Bentham targets claims worth at least $10M. It analyzes a proposed case to determine whether the realistic value is at least 8-10x the amount of funds Bentham is asked to commit in the transaction. Bentham aims to return about 3x to 4x on each investment. Though all Bentham’s funding is “bespoke”, in single cases, it prefers a 50/50 investment. In this model, Bentham commits to fund 50% of a capped lawyer fee budget. The lawyers commit to fund the other 50% (and anything over the cap). Ideally (but not necessarily), the client funds out of pocket litigation costs. 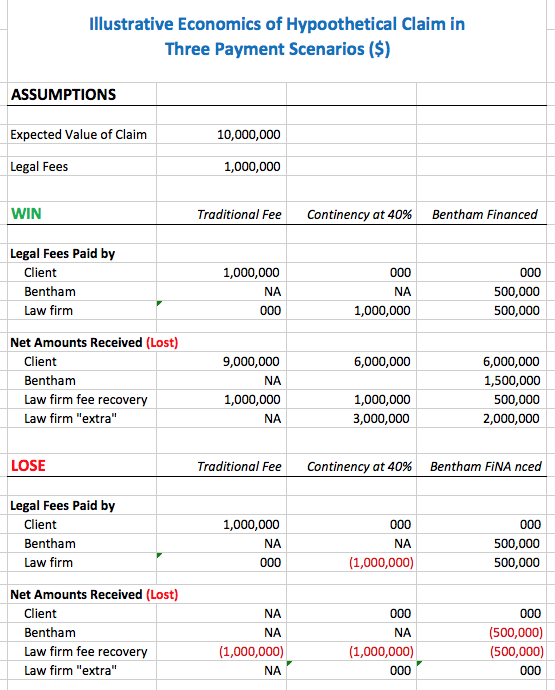 In this model, Bentham receives 20% of the litigation proceeds, the lawyer receives 20% of the litigation proceeds (on top of the 50% of fees already paid by Bentham) and the client retains 60% of the proceeds. For clients, this is equivalent of a full contingency arrangement (at a rate of 40%). Bentham also funds law firm portfolios. Portfolios must have at least three cases (though it prefers four or more), and can include all contingent cases a firm handles. For portfolios, Bentham’s return is “cross collateralized” by all of the portfolio cases. This means Bentham gets it return from whichever case(s) in the portfolio win. Portfolios are less risky for Bentham than single cases so the return terms for firms are more favorable than in 50/50. Bentham only receives a capped multiple of its invested capital instead of taking a matching percentage return from the litigation proceeds. Each firm’s financing is customized. The amount committed by Bentham in these arrangements is often based on percentage of estimated legal fees the firm might invest in the portfolio cases. However, the amount Bentham commits must ultimately be supported by the expected fee returns in the cases. Law firms can use the funding however they want, including to cover overhead, for out of pockets costs in the litigation, and/or for firm expansion. Though a firm’s upside relative to pure contingency is lower, so too is its downside. Risk trade-offs do not have a single correct answer but from a firm’s perspective, funding seems attractive. Bentham terms means firms can afford to take on more similar matters: with fees partially covered, for the same downside risk as with a contingency fee, the firm could take on multiple matters and diversify its risk. So far, Bentham’s portfolio investments have been with smaller and mid-size firms. In the last year, however, Bentham has talked to several Am Law 100 firms. Dave reports that big firms see financing as another bottom line booster. If, with Bentham assistance, a firm picks the right portfolio of cases to fund, Dave says it can see a material increase in revenue and realization rate. Bentham developed its Accelerator tool, a series of spreadsheets, to help firms model the impact. Does Litigation Financing Increase the Amount of Litigation? I asked Dave if he thinks financing increases the number of cases filed. He said Bentham invests in no more than 5% of matters it examines and prefers working with top notch lawyers and firms. So, while financing might allow a few more meritorious cases to proceed than would otherwise be possible, it does not materially increase the overall volume. Dave also reiterated that commercial litigation funders only receive a return if the cases they invest in are successful. Thus, funders are motivated to invest only in the most meritorious cases. Funding Dave says, therefore, does not encourage an increase in frivolous litigation as some critics suggest. Instead, Dave says funding assists claimants with strong cases to achieve fair outcomes by removing the financial imbalance between parties and by allowing clients to retain the best counsel for their case. Dave believes the big impact of funding is to shift market share. Because financing reduces fee risks, firms can take on more or different matters than they otherwise might. And clients can shop for better (more expensive) firms. With Bentham funding, clients can retain top notch firms that otherwise do not offer contingency arrangements. Over time, Dave suggests this will drive more litigation to the best lawyers, without driving more litigation generally. Does Litigation Financing Increase Lawyer Efficiency? As indicated at the outset, I thought financing could make litigation more efficient. I asked Dave if Bentham cares if firms handle cases efficiently. I expressed concerns, for example, that lawyers might treat financed matters as black holes where they can bill hours to meet quotas. Dave said Bentham wants efficient case handling and that financing works best for firms if they pick their best cases and use their best teams. Furthermore, he noted firms will have the highest ROI if they are efficient. The same logic applies to fixed fees or other alternative fee arrangements. After talking to Dave, it’s not clear that financing will in fact drive efficiency. Instead, it may be yet one more tactic to postpone serious changes in how lawyers practice. Firms have protected profits by laying-off staff and partners and by reducing real estate cost. In my view, firms will eventually exhaust such steps. At that point, they will have to change how lawyers work and how firms operate. So far, though, most large law firms have staved off fundamental change. Financing may be yet one more way to postpone the hard work of real change. Litigation finance has gained significant mind share recently. More and more financial firms offer it. After the 2008 crash, investors learned the hard way that risks were more correlated than they thought. At least for now, it seems litigation as an asset is not correlated, making it a very attractive investment. And it offers both clients and firms benefits. So I expect to see the litigation finance market continue to grow.